Mobile yard ramp 9m 6t. Stock of strength - 30%. - Wheels with polyurethane rim. It is used in warehouses and cargo docks for loading / unloading of semi-trailers, trucks, containers and railcars. Mobile ramp serves as a bridge between the ground and trucks, providing direct access for the loader to the truck. Mobile ramp hydraulic consists of two side load-bearing profiles, supporting frame, entry, the transport wheels. In the central part of the structure on the bottom of the frame, a hydraulic group is instaled and provides raising and lowering of the ramp. The design of the supporting frame is made of welded longitudinal and transverse sections and connected to the side supporting profiles so that the upper portion of the side support section acts as a protective barrier. Hydraulic group consists of a manual oil pump and two hydraulic cylinders connected to the oil pump by means of high pressure hoses. Oil pump includes a pump plunger type, oil tank and a unloading valve. Single-acting cylinders returns to the initial position under its own weight. The oil pump is mounted on one of the support beams. Entry and lip are made of corrugated metal. The flooring is made of expanded metal. On the sides of the structure, mechanical screw jacks are installed, ensuring the raising and lowering of the ramp. To move the mobile mechanical ramp, on the side of the carrier beam is pivotally mounted conveying block with screw connection (for One fork of the loader). On the front edge of the ramp, on the side supporting beam safety chains are fixed, to fix the ramp to the truck frame. A two-component epoxy enamel painted on the previously primed surface. The standard coating color: bright red RAL 3000. 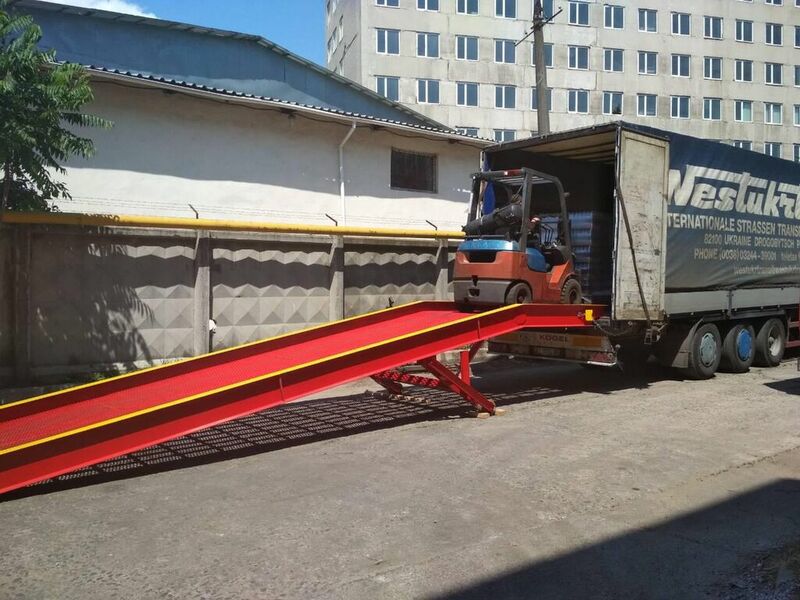 When ordering two Mobile ramps, you receive a discount, and also the delivery is carried out by one truck. So you save money and on delivery. Рампа мобильная гидравлическая 9м 6т. Мобильная рампа представляет собой передвижную гидравлическую конструкцию. Применяется на складах и грузовых доках для загрузки/выгрузки полуприцепов, автопоездов, контейнеров, вагонов. Рампа мобильная служит мостом между уровнем земли и грузовым транспортом, обеспечивая прямой доступ погрузчику в кузов. Для перемещения рампы мобильной применяется транспортировочный блок с винтовым зажимом (для одной вилы погрузчика). На переднем краю рампы на боковых несущих балках закреплены страховочные цепи для фиксации рампы с рамой грузового транспорта. Все изделия окрашены двухкомпонентной эпоксидной эмалью по предварительно загрунтованной поверхности. Стандартный цвет покрытия: ярко-красный RAL 3000. - Колеса с полиуретановым ободом. При заказе двух Мобильных рамп вы получаете скидку, а также доставка осуществляется одним грузовиком. Таким образом вы экономите деньги и на доставке. Двойная экономия!